That’s right, Bit of Butter is moving! Let’s ignore the fact that this means we have to move our house, Etsy items, and assorted detritus in the next few weeks and focus on the positive, shall we? We weren’t planning to move, but our real estate agent (who is amazing and wonderful) emailed us a house (just a mile away from our current abode). The next day I went to visit and the day after that, we put in a low-ball offer…that was accepted! The new house has a lot going for it, even though it needs a lot of work. Mostly, it has a lot of space for our family, the shop, and for friends to come over and share a glass of wine with us. Plus, it has the most amazing chandelier we’ve ever encountered by Mazzega, made out of interlocking pieces of Murano glass. 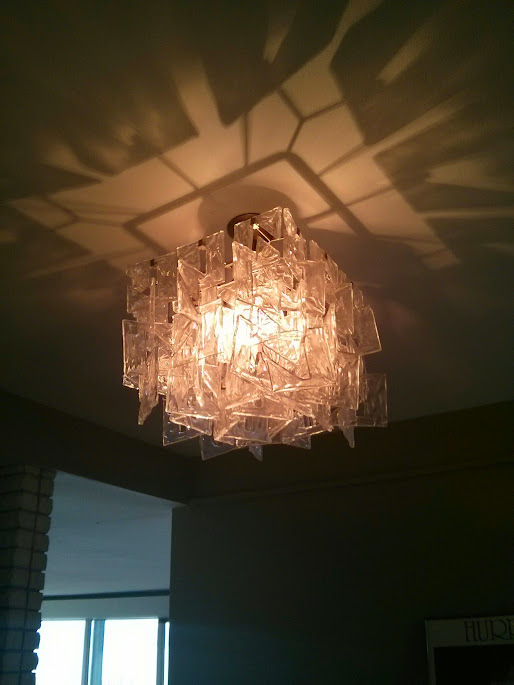 How could we not buy this house when this beautiful testament to mid-century design is in the entryway? So stay tuned for more posts about the new house as we begin to decorate, renovate, and explore!